4 Bedroom Terraced House For Sale in Windsor for Guide Price £612,500. A recently refurbished Grade II Listed 3-4 bedroom house situated in a superb central location within historic Eton. 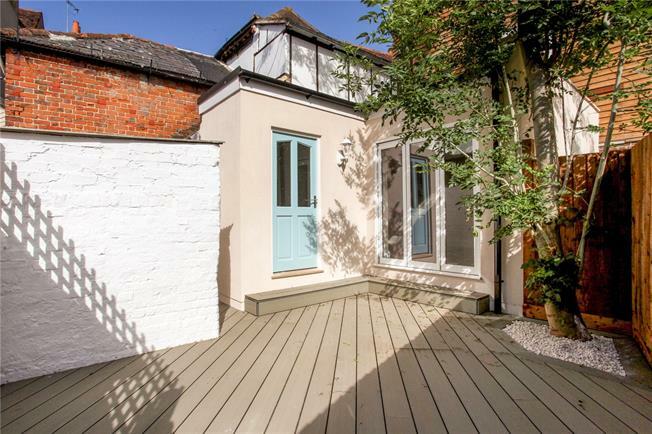 This property is close to Windsor & Eton Bridge and has the quaint shops, bars and cafes of Eton High Street on the doorstep. Ground floor accommodation comprises a sitting room with a roof lantern and bi-folding doors to a decked terrace together with a kitchen/breakfast room and cloakroom. The kitchen is superbly appointed with stone worksurfaces and gloss units featuring a central island and includes an integrated fridge/freezer, dishwasher, washing machine and double oven. Accommodation continues on the first floor with three bedrooms, a study and main bathroom. Of particular note, bedroom one enjoys views over Eton High Street. This property is situated in the heart of historic Eton High Street, between the River Thames and Eton College. An excellent range of shops are available in Eton High Street together with a good variety of public houses, bars and restaurants. Further amenities are available in Windsor, just across Eton Bridge. Trains to London Waterloo, Vauxhall and Clapham are available from the Windsor Riverside station with access to London Paddington, via Slough, available from Windsor Central station. The Crossrail Victoria Line is due to open in 2019 with direct trains from Slough to Central London allowing residents to get to Bond Street and Tottenham Court Road in under 40 minutes. Road links are very good with both Junctions 5 and 6 of the M4 within easy reach, providing access to the M25, M4, M3, Central London and Heathrow Airport terminal 5 only 8.6 miles away. Educational facilities are also excellent; in the private sector are Eton College, St. George's, Eton End PNEU, Upton House, Queensmead School and Eton Pre School Nursery. In the state sector are Eton Porny, Queen Anne’s, Windsor Girls' School and Boys' School. Bi-folding doors open onto a decked courtyard garden.